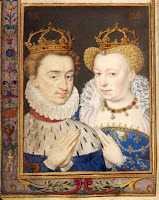 ... 1572 (440 years ago today), 19-year-old Marguerite de Valois, the Catholic daughter of a French king, was married off to a Protestant, Henri de Bourbon, king of Navarre and eventual king of France, "in a marriage that was designed to reunite family ties and create harmony between Catholics and Huguenots," as French Protestants were called. (image credit) All did not work well. Shortly before the wedding, Henri's mother died under suspicious circumstances, and 6 days after, Catholic mobs in Paris slew Huguenots of all classes in what's known as the St. Bartholomew's Day massacre. Marguerite saved her husband from the bloodbath – and also her lover, another man also named Henri. The marriage, which was marked by infidelities on both sides, ended by agreement in 1599, with Marguerite retaining the title of queen. She went on to publish scandalous memoirs, become a supporter of the arts, and to help care for the children of her ex-husband and his 2d wife. The inspiration for Alexandre Dumas' novel (and a recent film) called La Reine Margot, Queen Marguerite died in 1615.